In an awkward moment of instability, you may have twisted your ankle. Not a single day goes by without someone spraining this ligament. Sometimes from a misstep on the sidewalk, other times a quick change of direction on the basketball court, regardless the reason, you're not alone. If you’re suffering from a twisted ankle or ankle sprain, you're likely experiencing pain and discomfort, we can help! Our ankle bones and joints are held in position by elastic structures called ligaments. These ligaments work to protect the joint from irregular movements, such as twisting, rolling, turning, and bending. They are not invincible, nor indestructible. They do their job well, yet they can be subject to injury. In fact, if stretched beyond their limits, they can tear and become damaged, resulting in an ankle sprain. If you live an active lifestyle, you're most susceptible to experiencing the pain and discomfort associated with this injury and need to learn about how sports affect your feet. Especially in teens who are physically active, rapid shifting in movements put the joint at risk. Be careful not to let the ankle turn beyond its normal range of motion. If the foot remains planted on the floor but the ankle continues to stretch, a sprain occurs. More often than not, ankles will turn outward while the foot turns inward. The severity of a sprain varies from person to person due to the difference in the amount of pressure and force behind the movement. Once the ankle has turned beyond its normal range, you may have fallen to the floor or were not able to place weight on the foot. In its most severe form, you may have heard a "pop". 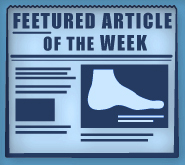 Dr. Michael Stein and Zeindelin Ahmad, DPM, rate ankle sprains as grade one, grade two, or grade three. They will evaluate your symptoms and find the most suitable treatment option. Grade one is a slight stretch with minimal damage to the ankle. Your ankle may feel stiff and appear slightly swollen but pressure can still be applied and walking is possible. Grade two is described as a partial tear of ligament fibers. The joint will feel abnormally loose, allowing the ankle to move in irregular positions. Symptoms include bruising, swelling, and tenderness. Walking with a grade two sprain is painful. When the ligament is completely torn, you've experienced a grade three sprain. This severe injury makes the application of pressure and walking extremely painful. The joint will bruise and swell immediately. Light grade ligament sprains can be treated at home with adequate rest and elevation, as well as the application of ice and compression. For the first 48 hours after your incident, the ankle should be elevated above the heart. Apply ice for 20 to 30 minutes, four times a day, to keep the swelling and level of discomfort to a minimum. A compression bandage or ace wrap should be used to support and immobilize the joint. Serve sprains may require crutches, splints, or boots. In some cases, even surgery will be necessary. If you can't apply pressure to your ankle, you don't see improvement within a few days, and the swelling and bruising is harsh, contact our experts. Dr. Michael Stein and Zeindelin Ahmad, DPM, will find an effective treatment plan for you. Call one of our three offices located in Pleasanton, San Leandro, or Los Gatos, CA, today!